NEW YORK-The Coast Guard is monitoring a collision between a orange juice tank ship and a dredging vessel that occurred in Newark Bay, Newark, N.J., at 1:51 p.m. today. The Orange Sun, a 669-foot Liberian flagged vessel and the dredging vessel New York were involved in a collision resulting in the New York taking on water and leaking a small amount of hydraulic fluid. Diving operations continue to stabilize the dredge New York. Coast Guard Station New York immediately launched two small boat rescue crews who arrived on scene minutes after initial report. A Coast Guard rescue helicopter from Air Station Atlantic City was also on scene to assist. The Coast Guard Cutter Sturgeon Bay, a 140-foot cutter home ported in Bayonne, N.J., is also currently on scene. The Coast Guard investigation team is on scene to conduct an assessment and investigation. The Orange Sun was escorted to a nearby anchorage by tug boats and Coast Guard awaits the damage survey. The Vessel Traffic Service at Coast Guard Sector New York has closed Newark Bay until operations stabilize the dredge New York become stable and vessels can safely pass. "The Coast Guard will continue monitoring the salvage operations on the dredge New York throughout the night," said Lt. Cmdr. Kenneth Moser, chief of incident management at Coast Guard Sector New York. "The Newark Bay waterway will remain closed until the situation onboard the dredge is stabilized." Below is a photo of the Orange Sky. Not a sistership but I believe owned by the same ship management company, Atlanship. The Orange Sky is 172 meters long and the Orange Sun is 204 meters. They say serving on an orange juice ship is just about the best duty a merchant mariner can get. I don't know if it's true but I'd rather breathe orange juice fumes for a month than have to whiff petroleum product for even one day. I recently completed the Basic Safety Training Modules of STCW in order to satisfy current maritime certification requirements. 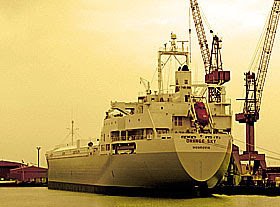 The class consisted of 16 students: a mix of commercial fishermen looking to get out of a struggling industry; one student who came off a German Heavy Lift vessel, three or four professional mariners in the tug and barge trade, and several non-mariners looking to get their first Able Body Seaman Certificates. One of the students was just in the class for a renewal of his BST, which has to be done every 5 years. Emergency signals, procedures and duties for crew members; the muster list; muster stations; station bill, etc. In addition to the instruction, students will practice and demonstrate their ability to use lifesaving equipment and flotation techniques during a "hands on" session in the water. In our cease, we had to swim two laps in our clothes and tread water while making a life jacket out of our pants. We also had to demonstrate proficiency with donning and doffing life jackets and survival suits, both in and out of water. This included hands-on practice on the fire field by using various extinguishers, fire hoses/nozzles, and breathing gear to attack and extinguish fires, crawling through a smoke-filled maze, and sweeping smoke-filled rooms for survivors. I have to say that by the end of the first day all the students in my training course were glad to be there, if only because it was still better to be at the Maritime Academy than working at sea in foul weather. Seriously, we all benefit from more training and education. It's good for us. And in this case, even professional mariners get a helpful refresher -- sometimes even a wake up call, like suddenly realizing it's time to lose a little weight, or take a walk instead of watching another re-run of Law & Order. BST is the first of many STCW modules professional mariners need to work on larger (200-ton or more) vessels and/or vessels working beyond the 200-mile limit. Other modules include: Bridge Resource Management (BRM) a.k.a. Bridge Teamwork Management; and Proficiency in Survival Craft and Rescue Boats (PSC). 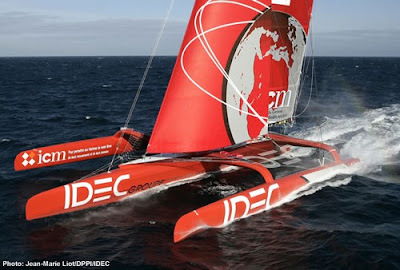 Interesting Boats: Joyon Rounds the World in 57.57 Days - A New Record! Quite a vessel. They just keep getting faster and faster. 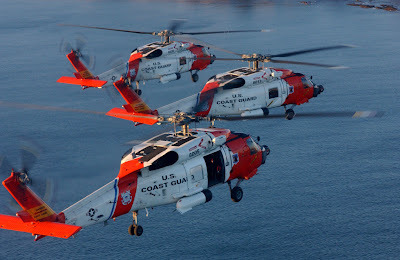 Here's the list of the USCG's Top Ten Rescues for 2007. Video Clips Here. If you ask me, the clips don't do the rescues justice. Also, if you read the archives of rescues over the year you'll wonder why some of the others didn't make the list. 1. Coast Guard rescue crews assist with over 160 rescues in the flood-ravaged Pacific Northwest. 2. A Coast Guard boat crew rescues three victims moments before their capsized boat sinks. 3. 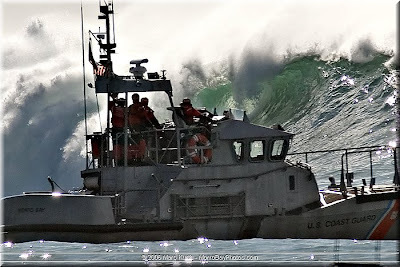 Coast Guard air and boat crews team up to free a sailboat pinned against jagged rocks by heavy surf. 4. Working with local authorities, a Coast Guard air crew rescues two young boys and two men caught in the current beneath a dam. 5. Coast Guard air crews from Florida provide humanitarian relief in the Dominican Republic after Tropical Storm Noel. 6. The crew of the Coast Guard Cutter Liberty rescues dozens after the cruise ship Empress of the North ran aground and began taking on water. 7. Coast Guard crews from across the Midwest provide mass evacuations when flooding left victims stranded and in peril in the across several. 8. A Coast Guard air crew rescues a woman attempting to row across the Pacific Ocean after her capsized in heavy seas. 90 miles west of Humbolt Bay, Calif.
9. A Coast Guard air crew sets an altitude record while rescuing an injured hunter from the summit of a mountain. 10. A Coast Guard air crew rescues two men so far from shore they had to stop to refuel at a oil rig on the way back. 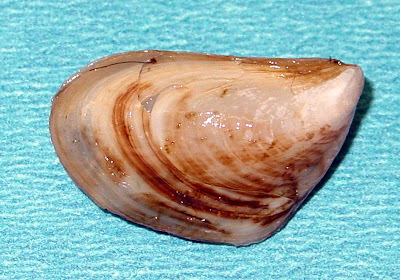 Invasive species, like zebra and quagga mussels, are in the Great lakes because of the improper discharge of ships' ballast water. Same thing is happening in other parts of the world as these and other species find their way to places they don't belong. The simplest solution to the problem would be for ships to exchange their ballast water 200 miles at sea. That's what they're supposed to do, but . . . they don't always do what they're supposed to do. With these new regs, ships will undergo more frequent inspections and will be required to meet higher standards of cleanliness. The USCG is also considering new rules. This is a testament to the robustness and seakeeping of the 47' MLB. On the other hand, I wish they wouldn't play so rough with one of my/our $2.9 million boats. A judge in California ruled against the U.S. Navy and for the whales today. The ruling requires the navy to shut down sonar withing 2,200 yards of whales and within 12 miles of the U.S. shore. It's just a preliminary injunction but it paves the way for further naval warfare restrictions. AP Story here. If you think you're eating grouper when you order it at a restaurant in Florida, you might want to think again. 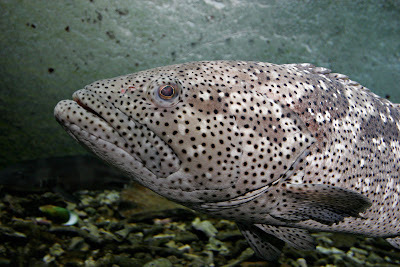 According to reports from Tampa many restaurants are serving Asian catfish, tilapia and other species as grouper. Why am I not surprised? I stopped ordering grouper a while ago. I haven't had a good piece of grouper at a restaurant in over ten years. Last one I remember having that I absolutely knew was grouper was at the Grouper Seafood Grille on the canal in Treasure Island, Florida. I'm not sure the cooks/chefs in some of these boutique restaurants even know what fish they're buying. I'm not sure some of the wholesalers even know. And it's not like you can ask the waitress to see the fillet before it's cooked. Best thing to do is look at a plate being served next to you. Even then, how can you tell without tasting it? Here's a tip. Grouper has a very distinctive texture when cooked. It's almost like it has a lobster-type snap to it when you bite down. Firm, meaty flakes when cooked properly, but not at all like haddock, tilefish or halibut flakes. Not the same conformity either. In other words, when you fork off a piece, each bite will be a different size. That's the best I can offer. While awaiting trial in a cell in Florida Guillermo Zarabozo apparently confessed his part in the murders of the Joe Cool's captain and crew. 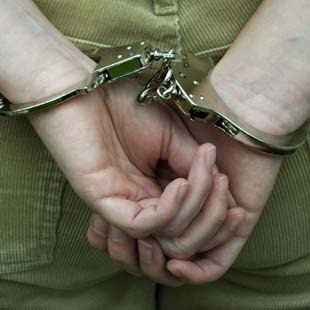 In the confession, made to or overheard by another inmate, Guillermo admitted to helping get rid of the bodies but not to shooting the victims or taking part in the actual murders. Guillermo, good citizen that he is, names his partner Kirby Logan Archer as the actual trigger man. Anyone who has ever watched an episode of L&O knows just how reliable these jail house confessions are. Regardless, these two numb nuts, Archer and Zarabazo, should be drawn and quartered or keel hauled. Why waste the money on a trial? JUNEAU, Alaska -- The Coast Guard is responding to a call for assistance from a disabled freighter 180 nautical miles northeast of Attu. The Mathawee Naree, a 554-foot Thai flagged freighter, became disabled late Monday night with approximately 28,000 tons of copper concentrate on board. The Coast Guard has dispatched the Cutter Jarvis to the scene and has also launched a Coast Guard C-130 to examine the situation. The Jarvis' estimated time of arrival is Thursday. Current weather conditions are 20-foot seas with 50-knot winds. The vessel has 24 people on board and carries 760 metric tons of fuel. The Coast Guard will continue to monitor the vessel's status. 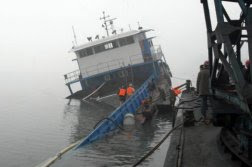 UPDATE 01/03/08: Freighter's main engines were repaired by crew and vessel is again underway. My friends John and Tina took these photos today from six to ten feet away. Crows have ben giving this guy a hard time -- and we've had quite a bit of snow with another foot coming tonight. Perhaps the stress is getting to him/her.